Last December, I brought you The All-Singing, All-Dancing Christmas Paloozas One, Two and Three. Before that, I brought you Creating at Christmas - Ideas for Projects. This year, I've been concentrating on the Chookeriffic Children's Book Giveaway. But that doesn't mean I plan to ignore Christmas activities for kids. Read on for some fun resources I've found to help parents, teachers and children. Here's one of my very favourite Christmas stories. I love the video version best of Raymond Briggs' The Snowman because the music is so beautiful. Here it is via Youtube. SchoolTube: The Madagascar Penguins in a Christmas Caper. Watch Know Learn is a great place to find educational videos. Luckily, educational doesn't mean boring. Here's a link to all Christmas videos at Watch Know Learn. Two I liked are Elmo Saves Christmas and Rudolph the Red-Nosed Reindeer - the song with lyrics and vintage Disney footage. Show your kids what we watched in the olden days! Kids can discover lots about Christmas as a holiday celebrated all over the world at Mr Donn's Holidays. Younger children will enjoy singing along and other fun with Boowa and Kwala - navigate to more via the icons top. Keith Ferrell has 12 Days of Christmas Sites we can share with kids. Here's the Reindeer Orchestra, where kids can tap reindeer noses to play Deck the Halls, We Wish You a Merry Christmas and Jingle Bells, or create their own songs. Top Marks have links to some cute Christmas Games and Colouring PDFs. Here are free templates, with letters to Santa. Here's some free Christmas clip art. Find three fun Christmas posters at PicFont. I love what the site krokotak has to offer. Take the time to browse if you are looking for printable games, Christmassy craft ideas including recycled cardboard, paper plates, ornaments, angel wings etc, four cute templates to cut, colour and add to a collage or display and many many more. 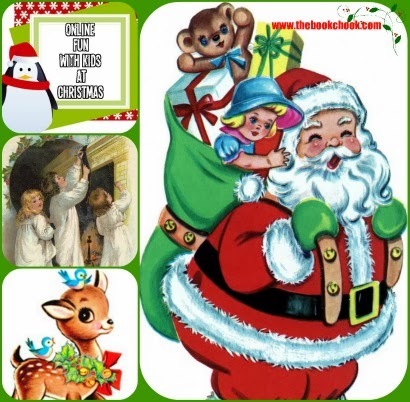 Teaching Ideas has lots of Christmas lesson ideas including library and display ideas. Here are printable Christmas Pictionary word lists and a printable list of Christmas songs from The Game Gal. Have fun too with this list of words for Charades. For some more active games, check out this list of 'Minute to Win It' Christmas games with instructions for each. There's an excellent list of Christmas activities suitable for young children here, complete with directions or links to directions. Christmas is such a perfect time to make instruments with kids and form your own family band. Kinderart have suggestions for some. Put on some Christmas music when your band is ready and raise the roof! Games that encourage us to think can be fun at any time of year! You might also like to read Games to Encourage Thinking, Play Guessing Games with Kids, and Literacy-Based and Other Guessing Games. Image credits in collage: (anticlockwise from top left)Penguin from PicFont; The Night Before Christmas, public domain, Reusable Art; Reindeer from Free Pretty Things For You; Retro Santa with Toys from The Graphics Fairy. If you've enjoyed this post, or any others at The Book Chook, I'd love you to help me spread my fun with literacy, learning and literature ideas by promoting via Twitter, Pinterest, Facebook, StumbleUpon, G+ or any other way you decide.